Let me admit up front that I don’t have the stomach—or the heart or the bladder—for books and movies that terrify me. I had my share of nightmares as a kid, lived in high-crime areas as an adult, and made more than one U-turn to avoid a situation that had “bad news” written all over it. Thinking too much or too long about any of these things will make my heart pound and bring on a cold sweat. It’s not a pleasant experience. I’m only half joking when I say that if I want to be terrified, I’ll look at my checkbook balance. A little suspense is okay, but in general, I steer clear of books and movies that announce they’ll terrify me and keep me from my eight hours of sleep. You’ll never find me munching popcorn at a slasher flick or lining up to watch a movie with supernatural evil forces. A Clockwork Orange cured me of any desire to spend time with deranged characters that don’t end up staring down the business end of Dirty Harry’s gun. I’ll watch shows like Criminal Minds because I know that—even though it might take several episodes over several seasons—the killer will be caught. The shows are scary, but they’re “safe.” There isn’t “too much” of the weirdo and, generally, there’s an explanation of why the killer acts as he does. And, of course, commercial breaks relieve the tension before I can do too much damage to my manicure. But books are, pardon the pun, a whole ’nother story. First, they involve more than an hour of my time. Second, unless the phone rings or someone comes to the door, I have to break the tension myself by putting the book down. And third, I get much closer to characters in a book. Recently I read a mystery/suspense/thriller that put me in the point of view of an out-of-control, mentally unbalanced killer and kept me there for page after page after page of crazy-thought. Before long, my creepy meter needle swung far into the red. I wanted to put the book down and leave it down, but it had been recommended by another writer and I felt obligated to finish it. By skipping over enormous chunks of the killer’s inner dialogue, I finally made it to the end. What I wish I’d done was skip to the end, make sure the guy was caught or killed, and then get the book out of the house. But I’ve been taking heat from Mike (my husband and the co-author of five books) for doing just that kind of thing far too often (in his opinion), so I hopscotched along, wishing I could scrub down my brain after every lengthy segment with the killer. Later, when I added the book to my electronic bookshelf, I faced a dilemma. Five stars meant I thought the book was amazing. Amazingly weird? Yes. Amazingly mired in the mind of a creepy killer? Yes. Just plain amazing? No. Four stars meant I really liked it and three that I liked it. Did I? No. At least, I didn’t like that creepy character. I didn’t like that he overshadowed everything else. I didn’t like that I didn’t understand the root of his creepiness. I didn’t like that he was still in my mind a week later. But it wasn’t fair, not was it a good reviewing practice, to let that subjective feeling/emotional reaction overpower my objective analysis of the book. Given that it had nicely crafted setting descriptions, interesting characters, plenty of action, conflict, suspense, jeopardy, the book was more than the “okay” signified by two stars. By extension of the same logic and the laws of fairness, I couldn’t give it one star and say I didn’t like it simply because of that one character. I compromised, gave the book three stars, and came away feeling grimy and unsatisfied. I felt as if I’d just wasted the day’s calorie allotment on a bowl of cold oatmeal without sugar or syrup or salt, as if I’d washed my hair with an expensive shampoo that didn’t get it clean. I decided that if I had such a severe reaction to a character in the future, I simply wouldn’t rate the book. But that’s getting around the issue, not resolving it. I propose a rating system for creepy characters and/or creepy books. If you have ideas about symbols to use to signify the creepy factor and standards for levels of creepiness, leave a comment and share those ideas. 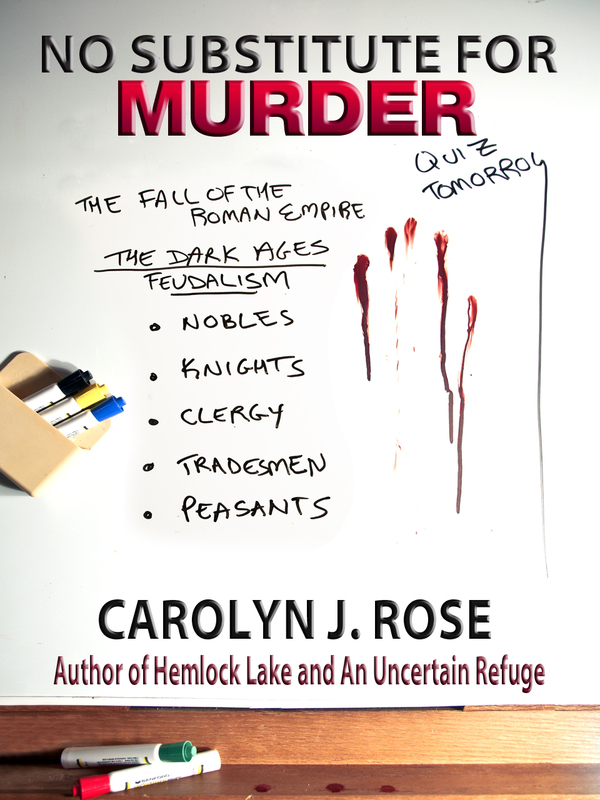 When the comment period closes, we’ll draw a name to receive a copy of No Substitute for Murder. It’s a cozy, so the creepy factor is low and the comic factor is high. Carolyn J. 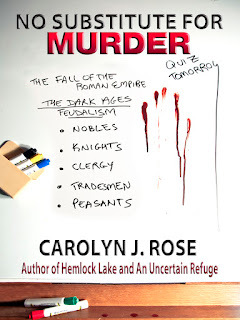 Rose is the author of several novels, including Hemlock Lake, Through a Yellow Wood, An Uncertain Refuge, A Place of Forgetting, and No Substitute for Murder. She penned two humorous cozy mysteries, The Big Grabowski and Sometimes a Great Commotion, with her husband, Mike Nettleton. By the Sea of Regret, the sequel to An Uncertain Refuge, will emerge in the late fall. She grew up in New York's Catskill Mountains, graduated from the University of Arizona, logged two years in Arkansas with Volunteers in Service to America, and spent 25 years as a television news researcher, writer, producer, and assignment editor in Arkansas, New Mexico, Oregon, and Washington. She founded the Vancouver Writers' Mixers and is an active supporter of her local bookstore, Cover to Cover. Her interests are reading, gardening, and not cooking. Good post, Carolyn. I don't always know what to do with creepy character books. They're hard to rate, that's a fact. What do I do with The Exorsist, for example? It creeped me out something fierce; so much, in fact, that I wouldn't let my sis read it.But I really did like it. And Silence of the Lambs? (Picture here a shudder the size of the San Andreas Fault on a bad day). So these days I just steer clear of them when I can. By the way, No Substitute for Murder, in my opinion, had just the right amount of creep-factor. It does make me a little crazy, when Carolyn lies in bed at night with a new book (One that I made a special effort to reserve for her at the library and pick up)Read the opening chapter, then skip to the final chapter. "What are you doing?" Asks I. "Finding out what happens to (insert character name here)" sez she. Reading habits aside, the lady is a terrific lady, a cherished wife and a heck of a scrabble player. Says the man who won last night's game. And Pam, I also steer clear - mostly. Sometimes the creepy character appears when I'm well along and I like the book enough to continue. Sometimes the book is part of a series and I've liked the others and know the protagonist will triumph. I had to read that book only in daylight and out at the pool in my apartment complex where there were other folks around. When the sun went down, I put it in the bottom drawer of my dresser under my winter sweaters. As if that would protect me. I would love that book! Love creepy, especially when the author can get inside a crazy person. Maybe because I've never experienced a lot of actual physical danger myself. I don't think the decision to not review a book you have ambivalent feelings about is a bad one, personally. Kaye, thanks for having my back.